Written by EverEscents on September 2, 2016 . Posted in Ingredients We Avoid. Ever wondered what you are putting on your face? These days the labels can be very deceiving so if you don’t know what you’re looking for, you are bound to fall in the trap of buying something that says it’s good for you but really isn’t. Read on to learn what words to look for and what they are actually doing to your body! We’re seeing fewer chemical preservatives, a.k.a “parabens,” on labels because consumers have become aware of the potential problems with parabens, a newer preservative, under the name “phenoxyethanol” (or ethylene glycol monophenyl ether), has emerged into conventional and even “certified organic” skin care as a safer alternative. Japan recently banned the use of phenoxyethanol in all cosmetics, while most other countries have limited its use to 1% concentration. Some studies have linked aluminium to Alzheimer’s disease, though recent research has cast doubt on the connection. Other studies have indicated that aluminium may be linked to breast cancer and other brain disorders. Aluminium, in the form of powder, is used in self-care products such as antiperspirant deodorants. Aluminium is unequivocally a neurotoxin. It can cause irritation to the skin, it’s an endocrine disruptor, and it causes birth disorders in animals. The average person will consume, absorb and/or eat three pounds of aluminium in their lifetime. Wow! Think about that next time you reach for Dove or Old Spice on the shelf. Formaldehyde is a known human carcinogen linked to leukaemia, pancreatic and skin cancer, skin irritation, and cirrhosis. It is typically found in nail polish, eyelash glue, and hair smoothing and straightening products like the popular Brazilian Blowout treatment. Dioxins are also found in non-organic tampons, as most conventional cotton is genetically engineered, sprayed with pesticides, and treated with bleach. Toluene is often used in glues, adhesives, chemical detergents, dyes, paint and paint thinners, plastics and many other industrial substances. Why would we want that in our skin care? Look out for this chemical also hiding under the names: benzene, methylbenzene, toluol and phenylmethane. You may see it in nail polish or hair colouring products. It seems that over 90% of conventional skin care products are packaged in plastic these days. If you spend all this time creating a beautiful product with organic plants, herbs and high-quality ingredients, wouldn’t you want to store it in something that protects the integrity of the formula? Storing products in cheap plastic shows a lot about the quality of the skin care. Opt for BPA-free plastic when glass is not possible, because Bisphenol A (BPA)—the compound found in plastic—can leach into skin care products. Research has shown that BPA can be absorbed through the skin and we don’t need any more estrogen-mimicking happening in our bodies. Glass is the best option for storing skin care, but do remember to still read the labels, as even the “top-shelf, high-end” skin care products packaged in glass are filled with chemicals. Written by EverEscents on September 27, 2015 . Posted in Ingredients We Avoid. – Look at the percentages – When buying hand sanitisers make sure the minimum alcohol content is 60%. If it’s under this percentage, it’s not worth buying as it loses its effectiveness and will not stop the cold and flu viruses from spreading. The bottle says it kills all the germs on your hands. For it to act properly, the concentration of the alcohol needs to be above 60%. – Avoid Triclosan – many people are not aware of this additive but it is found in nearly every antimicrobial product including gels, soaps and toothpaste. This additive is a known endocrine disruptor. Research shows Triclosan may lead to hormonal disruptions and cause bacteria to adapt to its antimicrobial properties which create more antibiotic resistant strains. 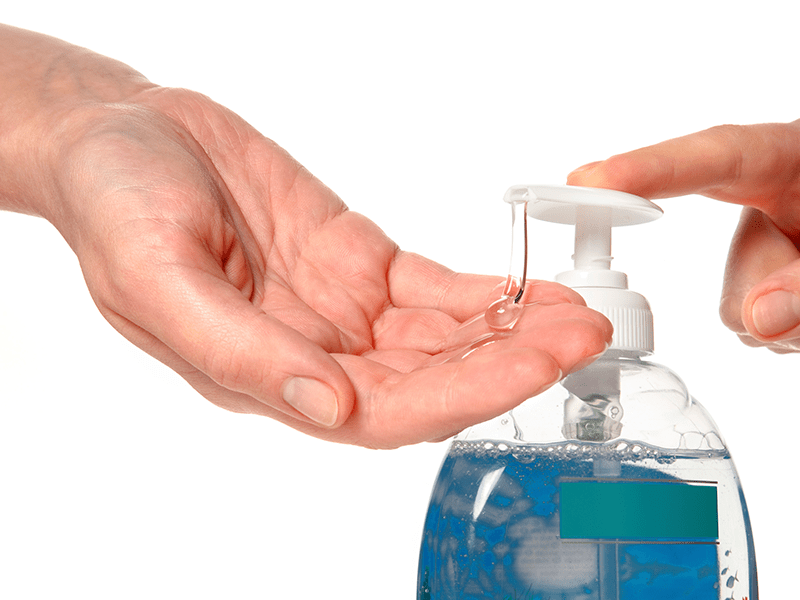 Triclosan contributes to making bacteria resistant to antibiotics. Using hand sanitizers may actually lower your resistance to diseases by killing good bacteria, which helps protect against bad bacteria Triclosan is also know to harm the immune system. – Not a silver bullet – Most people think that if they just use enough hand sanitizer, that they will be safe from the spread of germs. However, no product now on the market can kill everything. An example of this is that it won’t kill the Norovirus – which is responsible for stomach flu. It is important to understand that even with the sanitizer, you are still somewhat vulnerable. – Dirt and grease – it is also a little known fact that if someone has dirt or grease on their hands, the sanitizers will also not be effective as the dirt and grease form a sort of protective layer on the hands so that the sanitizer cannot make contact with the bacteria underneath. – Toxic chemicals – If your hand sanitizer is scented, then it’s likely loaded with toxic chemicals. Companies aren’t required to disclose the ingredients that make up the scents and are therefore generally made from dozens of chemicals. Synthetic fragrances contain phthalates, which are endocrine disrupters that mimic hormones and could alter genital development. – Not good for kids – We all know that kids come with the increased liability of touching unclean things and putting their hands in their mouths. And mothers have found the new age solution to their woes – hand sanitizers. But, if you have ever read the fine print behind the bottle you will see a warning telling you to keep it away from kids. That is because your child could be seriously harmed if he/she ingested it. There have been a number of reported incidences of alcohol poisoning in children due to hand sanitizers. While in the case of adults a person would need to swallow large quantities for something untoward to happen, for children a small amount is enough. Written by EverEscents on February 2, 2014 . Posted in Ingredients We Avoid. Check out this list of nasties to avoid in your hair and skin care products – read the ingredients list to make sure your favourite products don’t contain these ingredients as they are not any good for your health or the environment. Parabens: Methylparaben, Butylparaben and Propylparaben are some of the most common Parabens in cosmetics and anything else with ‘paraben’ in the name. A chemical preservative found in underarm deodorants, moisturises, hair care and other cosmetics that has been shown to mimic the action of the female hormone estrogen and may drive the growth of breast tumours. A study published in the Journal of Applied Toxicology has found that breast tumours commonly contain Parabens. There is also some evidence that Parabens may potentiate the damaging effects of UV radiation. DEA (diethanolamine), MEA (Monoethanolamine) & TEA (triethanolamine): Hormone-disrupting chemicals that can form cancer-causing nitrates and nitrosamines. These chemicals are already restricted in Europe due to known carcinogenic effects. In the United States however, they are still used despite the fact that Americans may be exposed to them 10-20 times per day with products such as shampoos, shaving creams and bubble baths. Repeated skin applications of DEA-based detergents resulted in major increase in incidence of liver and kidney cancer. Formaldehyde-releasing preservatives: these are called DMDM Hydantoin, Diaxolidinyl urea, Imidazolidinyl, methenamine or Quarternium-15. These are commonly found in hair products and skin moisturisers. Formaldehyde is classified as a probable human carcinogen by the EPA, which provides sufficient evidence that formaldehyde causes nasopharyngeal cancer in humans by the International Agency for Research on Cancer. These act as a carcinogen, causes allergic reactions and contact dermatitis; headaches; irritates mucous membranes; eye damage; linked to joint and chest pain; depression; headaches; fatigue; dizziness and immune dysfunction. FD&C Colour Pigments: Synthetic colours made from coal tar, containing heavy metal salts that deposit toxins into the skin, causing skin sensitivity and irritation. Absorption of certain colours can cause depletion of oxygen in the body and death. Animal studies have shown almost all of them to be carcinogenic. These colours are used in mainstream Blonde shampoo’s. Fragrances: Most synthetic fragrances can indicate the presence of up to four thousand separate ingredients, many toxic or carcinogenic. Symptoms reported to the FDA include headaches, dizziness, allergic rashes, skin discoloration, violent coughing and vomiting, and skin irritation. Clinical observation proves fragrances can affect the central nervous system, causing depression, hyperactivity, irritability, inability to cope, and other behavioural changes. Polyethylene Glycol (PEG’s): Potentially carcinogenic petroleum derived ingredient that can alter and reduce the skin’s natural moisture factor. This could increase the appearance of aging and leave you more vulnerable to bacteria. Used in cleansers to dissolve oil and grease. It adjusts the melting point and thickens products. Also used in caustic spray-on oven cleaners and hair care products. Propylene Glycol (PG): Gaseous hydrocarbons which in a liquid state act as a “surfactant”. They easily penetrate the skin and can weaken protein and cellular structure. Commonly used to make extracts from herbs. PG is strong enough to remove barnacles from boats! The EPA considers PG so toxic that it requires workers to wear protective gloves, clothing and goggles and to dispose of any PG solutions by burying them in the ground. Because PG penetrates the skin so quickly, the EPA warns against skin contact to prevent consequences such as brain, liver, and kidney abnormalities. But there isn’t even a warning label on products such as stick deodorants, where the concentration is greater than in most industrial applications. Sodium Lauryl Sulfate (SLS) & Sodium Laureth Sulfate (SLES): Detergents and surfactants that pose serious health threats. Used in car washes, garage floor cleaners and engine degreasers – and in 90% of personal-care products that foam. Animals exposed to SLS experience eye damage, depression, laboured breathing, diarrhea, severe skin irritation, and even death. Young eyes may not develop properly if exposed to SLS because proteins are dissolved. SLS may also damage the skins immune system by causing layers to separate and inflame. When combined with other chemicals, SLS can be transformed into nitrosamines, a potent class of carcinogens. Your body may retain the SLS for up to five days, during which it may enter and maintain residual levels in the heart, liver, the lungs, and the brain. Alcohol, Isopropyl (SD-40): A very drying and irritating solvent and dehydrator that strips your skin’s moisture and natural immune barrier, making you more vulnerable to bacteria, molds and viruses. It is made from propylene, a petroleum derivative and is found in many skin and hair products, fragrance, antibacterial hand washes and antifreeze. It can act as a “carrier” accelerating the penetration of other harmful chemicals into your skin. It may promote brown spots and premature aging of skin. It is also known to cause headaches, dizziness, mental depression, nausea, vomiting, narcosis, anesthesia, and coma. Triclosan: Triclosan is used mainly in commercial antibacterial liquid soaps, cleansers, deodorants, detergents, toothpastes, mouthwashes, antiperspirants, cleansers and hand sanitisers as a preservative and an anti-bacterial agent. The EPA investigated Triclosan and classified it as a pesticide and it is not considered a cosmetic ingredient and it has given high scores as a risk to both human health and the environment. Triclosan can pass through skin and is suspected of interfering with hormone function in humans. Toluene: Made from petroleum or coal tar, and found in most synthetic fragrances, nail polish and hair dye, this is used to improve adhesion and add gloss. Chronic exposure linked to anemia, lowered blood cell count, liver or kidney damage, and may affect a developing fetus. A lot of the above ingredients are very commonly found in beauty and hair care products and unfortunately not many people are aware of this. Next time you pick up a beauty product, be sure to turn it over and read the ingredients, you will be surprised! EverEscents are proud not to use any of the above nasties in our products. EverEscents products are also proudly Australian owned & made (even the bottles & labels), Vegan friendly, Cruelty Free & environmentally responsible. Written by EverEscents on December 17, 2013 . Posted in Ingredients We Avoid. PVP/VA Copolymer is the ingredient found in most mainstream hair care products that provides the hold factor. So it is very common in most Hairsprays but also found in gel’s, wax’s, pomades and styling creams. It is a synthetic ingredient that is derived from petroleum. PVP (also known as Polyvinylpyrrolidone) was the main ingredient in the first really successful hairsprays in the early 1950s. This polymer worked as a hairspray because it was soluble in water. This meant it could be rinsed out when you wash your hair. PVP tended to absorb water out of the air, giving hair that tacky look that was so common in the sixties. Unfortunately no one was aware of the dangers that came with this Polymer. If particles of PVP/VA Copolymer are inhaled, it can cause damage to the lungs in sensitive individuals. It can be considered toxic, since particles may contribute to foreign bodies in the lungs of people. Up until a few years ago, this ingredient was considered safe to use however now it is definitely an ingredient that is better to avoid. Here at EverEscents we do not use this ingredient in ANY of our products and especially not in our Hairspray. Our Grapefruit and Lemon Grass Hairspray is not only kind to you but is also kind to the environment by not having an aerosol and instead having an environmentally friendly trigger spray. This beautiful product contains a natural UV protector and hold factor which means no petro-chemicals, plastics or polymers. This gentle formula also means no more eye and scalp irritations. Written by EverEscents on September 1, 2013 . Posted in Ingredients We Avoid. Did you know that putting chemicals on your skin or scalp may actually be worse than eating them? When you eat something, the enzymes in your saliva and stomach help to break the chemicals down and flush them out of your body. When you put them directly onto your scalp, they are absorbed straight into your bloodstream without filtering of any kind and going directly into your organs. The EverEscents Blog topic this week is SULFATES. They are esters of sulphuric acid. The most common one is Sodium Laurel Sulfate and is found in many mainstream shampoos. This is exactly the same ingredient that you would find in an engine degreaser! Not really what you want to be putting on your scalp! How do you tell if your shampoo contains Sulfates? There are many types of Sulfates and some of the common ones are; Alkylbenzene sulfonate, Ammonium laureth or lauryl sulfate, Ammonium or Sodium Xylenesulfonate, Sodium C14-16 Olefin Sulfonate, Sodium cocoyl sarcosinate, Sodium laureth sulfate, Sodium myreth sulfate, Sodium lauryl sulfate, Sodium lauryl sulfoacetate, TEA- dodecylbenzenesulfonate, Ethyl PEG-15 cocamine sulfate, and Dioctyl sodium sulfosuccinate. If your shampoo has any of the above then it has Sulfates. If it states that it is “Sulfate free”, then it doesn’t contain Sulfates. There are many great Sulfate-free alternatives currently available. Here at at EverEscents Organic Hair Care, we have NEVER used Sulfates. What are some of the problems associated with Sulfates? Given the lack of adequate long term research regarding these ingredients, no-one really knows what the gradual cumulative effects of long term repeated exposure will be. Are you willing to put your health at risk? Written by EverEscents on August 4, 2013 . Posted in Ingredients We Avoid, Ingredients We Choose. Having a healthy and happy immune system is a key to not only feeling well, but also looking fabulous! After all, that is what keeping your hair looking its best is all about, right? Did you know your liver must filter every chemical and food that enters your body. So, it becomes overtaxed when you assault it with chemicals like hair dye and toxic shampoos and conditioners. If your liver isn’t functioning at 100%, then your eyes, skin and hair will suffer too. Purple and blue shampoo & conditioners are often used to help brighten blonde and grey hair. It can help neutralize orange, yellow, or green tones, since purple/blue is opposite to these colours on the color wheel. This type of shampoo should not be used every day, since it can actually cause very light hair to turn purple. Instead, most professionals recommend using it about once each week. According to Dr Mercola, artificial toxic blue dyes have been linked to causing kidney tumors in mice. They have also been linked to ADHD, allergies, and asthma. Several European countries have banned Blue 1. Blue 1 “Brilliant blue” is derived from coal tar and is not digestible by the body. Silicones in hair care – there is a natural alternative! Written by EverEscents on July 21, 2013 . Posted in Ingredients We Avoid, Ingredients We Choose. Most of the highly commercialised lines of hair products (Pantene, Garnier Fructis, Aussie, Tressame, Sunsilk, etc.) contain silicones. These are ingredients that generally end in -cone, – conol, or -xane. If at all possible avoid silicones in your hair products. In the short term, silicones will make hair look sleeker and less frizzy, but in the long run they will coat the hair shaft and seal out moisture, causing the hair to become straw like, less defined, and frizzy. Hence, silicones make quick fixes for frizz, but over time, they are truly damaging your hair. Sulfates get rid of silicones, but at the expense of completely stripping your hair of all of its natural oils! The solution to these problems is to eliminate both sulfates (in your shampoos) and silicones (in your conditioners and styling products). Silicones that are not soluble in water and build up on the hair: Cetearyl methicone, Cetyl Dimethicone, Cyclomethicone, Cyclopentasiloxane, Dimethicone, Dimethiconol, Stearyl Dimethicone, Amodimethicone (and) Trideceth-12 (and) Cetrimonium Chloride, and Trimethylsilylamodimethicone. Note: Trideceth-12 and Cetrimonium Chloride are only considered a silicone when both are combined with Amodimethicone. EverEscents Organic Hair Care does not use Silicones in any of our products. One of our flagship products is our Organic Moroccan Oil (of which most competitor products contain up to 80% silicone!). We do however use an amazing natural alternative in our Organic Moroccan Argan Oil called Lexfeel Natural. Lexfeel is a castor oil emollient which has a similar feel to silicone and is used to assist with smoothing hair and leaving it truly healthy.